Dr. Guanghong Liao graduated the medical school from the Shanghai Medical University and soon after that, she completed her residency program at the Harbor-UCLA Medical Center. She is now specialized in pathology and also is board certified in Pathology. 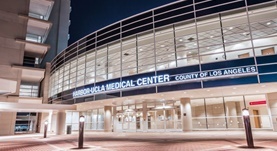 Dr. Liao is currently affiliated with the Harbor-UCLA Medical Center. During her career, she has also contributed to 4 publications of medical interest. Dr. Guanghong Liao has contributed to 2 publications. Aberrant modulation of the BRCA1 and G1/S cell cycle pathways in alcoholic hepatitis patients with Mallory Denk Bodies revealed by RNA sequencing. Liu, H.,Gong, M.,French, B. A.,Liao, G.,Li, J.,Tillman, B.,French, S. W.; Oncotarget. 2015 Dec 02. Liao, G.,Wen, Z.,Irizarry, K.,Huang, Y.,Mitsouras, K.,Darmani, M.,Leon, T.,Shi, L.,Bi, X.; Brain Res.. 2010 Feb 16.